Hey guys! Laura here. The reason Mom isn’t doing this review is because she already did … but it was accidentally deleted. She threw such a tantrum over it that I decided to step in and write about our FANTASTIC breakfast at Green Eggs (no ham). Mom had read great things about this place on the Internet, and being that we still had two more restaurants to visit in order to complete our “Tour of Bristol”, we decided to check it out. We needed some nourishment since we had haircut appointments later in the day, so we visited the restaurant at 11:20 a.m. The restaurant is adorable! Beautiful colored flowers accented each table, cute little decorations hung on the walls and the ceiling (including a rubber chicken), and each table had a stack of colored menus on it for your viewing pleasure. The daily specials were written on a whiteboard which hung on the wall between the two large front windows. 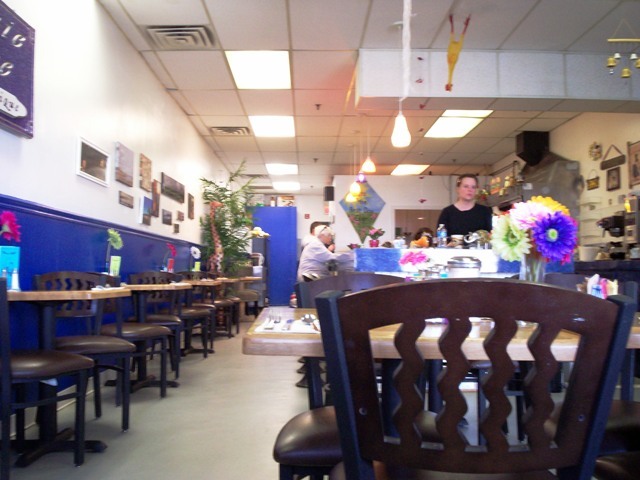 Although there were several tables, you could also sit at the counter if you were dining alone. It is really a cute setup. We were immediately greeted by our waitress (we unfortunately didn’t get her name) as we entered the restaurant and sat ourselves. She offered us coffee ($1.75 each) and we accepted. 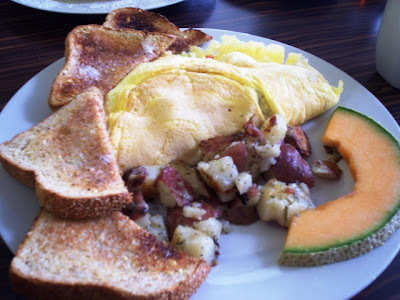 She then pointed out the specials on the whiteboard, which is where I saw my future meal – the Hey Jude omelet ($8.75). This omelet was comprised of bacon, tomato, avocado, and mozzarella cheese. It also came with homefries and my choice of toast (I chose oat). How could I not get this? Mom took a few minutes to look over the menu and finally settled on three chocolate chip pancakes ($7.50) and a side of bacon ($3.95). Our waitress retreated to the open kitchen to get the food party started. Green Eggs has pretty much everything you could think of when it comes to breakfast. They have heavy things like the “Monkey Business”, which is an order of Texas style French toast stuffed with bananas ($6.75) served with butter and powdered or cinnamon sugar. They have light things like the “Soldier Boy”, which is an egg white omelet with fresh tomato, Swiss cheese, and spinach ($8.25). Green Eggs also makes fresh egg sandwiches with your choice of fillings, waffles, muffins, and you can even make your own omelet. They have a kids menu and a long list of sides if you dare to add on to your big breakfast choice. It seems that Green Eggs uses quality ingredients that you may not find at your local breakfast dive, which is a nice change of pace for the average diner. When our food arrived, both Mom and I were surprised at how big the meals were. At first we had been thinking that the prices were a little on the high side, but now we knew why – you get a LOT of food. My omelet was out of this world. The tomato helped break up the dense avocado while the mozzarella cheese held it all together. The toast was fantastic and the homefries were actually red potatoes cut into chunks and seasoned. My plate, as well as Mom’s, was topped with a slice of cantaloupe that was fresh and juicy. Amazing! 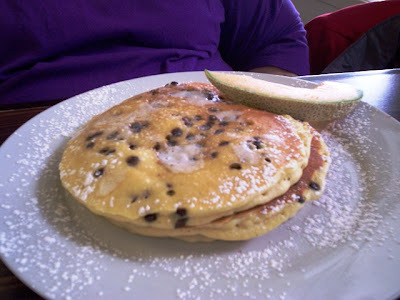 Mom’s pancakes were huge, but the taste was light and fluffy. She was actually afraid that she wouldn’t be able to eat it all (we hate having to bring food home), but they were so airy that she ate every bit. There were chocolate chips inside every bite and her side of bacon was tasty and cooked perfectly. Our waitress returned to the table several times to check on us and to refill our coffee. She has also brought over two glasses of water upon Mom’s request. She was excellent! It doesn’t look like our girl charged us for tax, which I didn’t notice until now. Oops. With 20% tip, we left her $28. We did not visit the restroom, but if it’s anything like the dining room, I’m sure it looks great. This will NOT be our last visit to Green Eggs. Tucked away inside the Bell Tower Plaza, the restaurant is hidden from the road. However, once you taste the fabulous food, it will soon become one of your favorite restaurants in Bristol. "Would you, could you come again? Would you, could you with a friend?" "I would, I could come here again. I would, I could come with a friend. 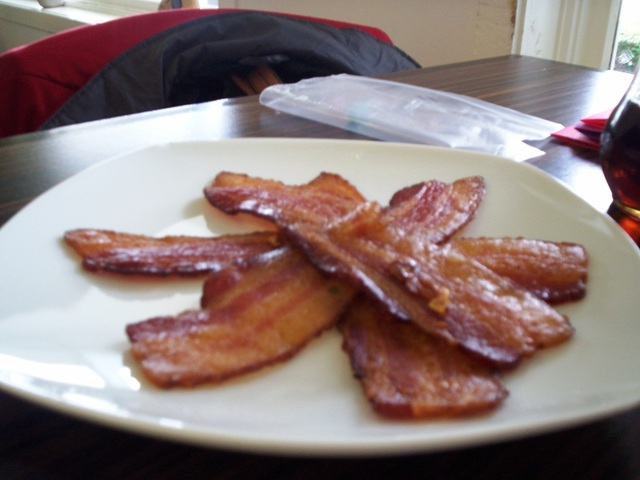 To set another breakfast date." 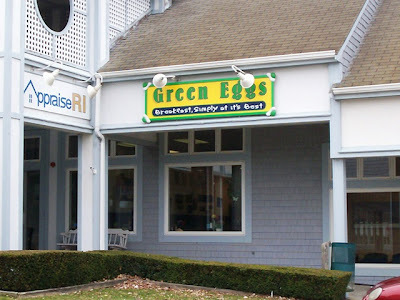 Green Eggs is open from 6 a.m. to 1 p.m. Monday through Saturday, and 7 a.m. to 1 p.m. Sunday.